Gosh, it’s been a while! It’s really been a crazy last bunch of months that began when my daughter started 1st grade. Last year she was in Kindergarten which; since she’s in an accelerated school, was essentially like 1st grade so I thought I had a grasp on how it would go…but no…I didn’t. She was immediately slammed with homework which is part of the reason I’ve been busy. Then there’s the house stuff….once we started getting into a routine we discovered we had bedbugs! That’s a topic for another post that I want to write someday. As that was happening we discovered that an upstairs window was causing a leak in the middle of our living room, but I figured out how to deal with it. Then our dog got sick, then the holidays, we discovered that a ceiling fan stopped working because of a small fire inside of the metal containment (which was rather horrifying to me), then the Polar Vortex and a ruined car rim, then a clogged drain…You get the idea, right? It’s been harrowing, to say the least. But lately, I’ve been starting to figure out how to weather it all. For a while I just couldn’t take this house stuff, I’m still not sure I can. For me it’s been a very intense and crazy ride and I didn’t really want to face it for a while. But I slowly started to make some progress again. It started very small. 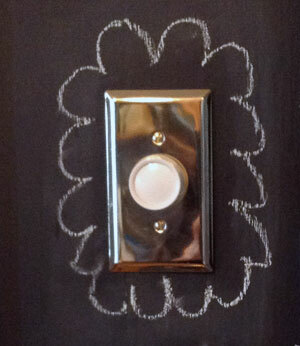 I changed a light switch panel. Every night one of the last things I did was switch off the kitchen light and it had the ugliest cover, dingy white with rounded corners, on a dingy wall. I got really sick of it being the last thing I saw. So I went to Home Depot and bought a brass cover. Amazing! I love it. But, the wall was still dingy and I’d been dying to paint it with chalk paint so a few weeks ago I went and bought some paint for $10 and Stella and I painted that wall! Amazing! 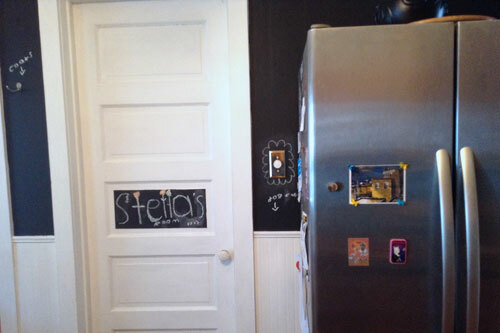 I had Stella paint the beadboard and trim white while I painted the upper wall with black chalk paint. We all loved it. Small things, small things. Another small fix was adding a screen to our bathtub drain. After the clog happened (a mere 6 months after having our pipes cleaned when we first moved in) I made another trip to Home Depot and got this small copper colored screen. It’s such a small thing but it has a big impact on my mind. Before I was using a plastic cover that didn’t stay in place and looked grungy. This little screen has a much more elegant and complete feel to it. So, progress is being made. Meanwhile, I’ve been going crazy on Pinterest and really thinking about the bigger changes I want to make, and how to approach them. I want to share some of these thoughts over the next few posting, so stay tuned!